"A deer has to be taken with one shot. I try to tell people that but they don't listen." I know someone who enlisted in the army and was quickly put into action in the Middle East. I have pretty vivid memories of his demeanor prior to his deployment, and all of them involve him smiling. His zest for life was exhausting. His enthusiasm was so constant that it became tedious. You could never just sit back and relax and enjoy the moment because he was always thinking about the next step. What could we be doing that was more fun? What would the world look like tomorrow? When he returned from his tour overseas, I met up with him for dinner to celebrate. He still looked the same. His voice still sounded the same. Something was different though. Everything else was different. He told stories of some of the ugliness of war, but the picture was never fully painted by his words. I don't know if he was incapable or simply didn't want to go into too much detail. I didn't press for more. He said he was happy to be home and in a way I believed him, but the zest was gone. The enthusiasm seemed like a distant memory. He talked only about the past and didn't seem all that interested in the future. He barely smiled at all. 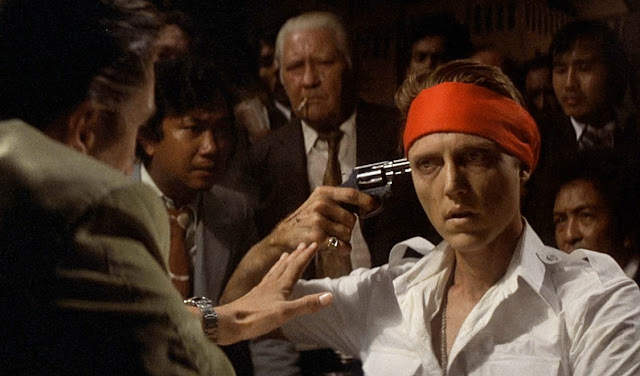 The Deer Hunter is a cinematic masterpiece directed by Michael Cimino that tells the story of three young men who leave behind their lives as factory workers in order to serve their country in Vietnam. I had seen the film before but so long ago that I was barely even able to qualify for a PG-13 movie, and unsurprisingly the mind of a kid barely a teenager isn't quite ready to process the themes of a film such as this. Needless to say, this was an eye opening experience. What I really found fascinating was the fact that of a three hour running time, so little of it was actually spent with them in combat in Vietnam. The first act may test some of the audience's patience but I found it wonderfully developed these characters with perfect pacing and essential, important dialogue. This sequence is mostly centered on a wedding and one of my favorite shots from the entire film involves the bride and groom drinking from conjoined goblets with the goal being to simultaneously drink without spilling a drop, and the camera zoomed in on two tiny splashes that stain her gown. Clean consumption symbolizes good luck for life, and this one shot so perfectly foreshadows the horrors that are to follow. Act two brings us into Vietnam and introduce us to the iconic Russian roulette scenes that are so haunting and hard to watch but you simply cannot look away. I have no idea if the game itself was actually ever played during the war, but honestly it seems irrelevant. The concept of a one-in-six chance that this could be the last moment of your life feels so fitting for a war setting like this, that unnerving us with each pull of the trigger is an incredible representation of the stakes of sending our youth into war. The performances in this section of the film are so absolutely perfect that they only increase the horrifying nature of the content, with Robert DeNiro and Christopher Walken doing Oscar nominated and Oscar winning work, respectively. The final act of the film brings us back home to Pennsylvania, and it is here when I couldn't help but think of the brave young man I know who isn't quite the same anymore. I can't comprehend it and I don't think even a masterful film can truly make someone like me understand just what war does to a human being. In the film, people ask Mike (DeNiro) how he is and he says fine with a smile on his face, but how can it be that simple? How can one be "fine" after experiencing such pain, seeing such atrocities, coping with such stress and fear? I will just be there to ask him how he is. When he says fine, I will smile. Hopefully he will smile back. A great film I have buried in my VHS collection. It is one of those powerful but emotionally draining films I rarely watch a second time, I'm surprised I bought it all those years ago. Great post! Wow, a VHS collection? That's actually awesome, I haven't even seen a VHS tape in my home in years. Had a player probably 5 or 6 years ago and it broke, and away went any film I had with it. Thanks, you are spot on that the film is draining and isn't the type that is easy to revisit. I will at some point simply because it is so well made and I admire it so much.